I had a break at the winery between the barrelling of the "first harvest" and the cold soak of the "second," so a took a road trip down to Santa Barbara to visit a bestie who lives there and to sample the foods and wines of the area. If you have not traveled to the area, I highly recommend that you do. What makes it remarkable from a gastromonic standpoint is the year round growing season--the vegetation has boundless culinary delights all at my fingertips. Many, in fact, were just in the small garden out back. 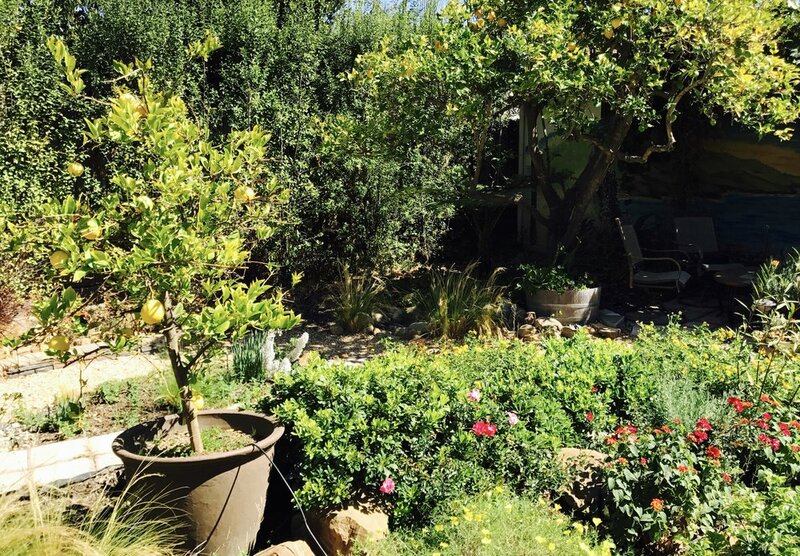 The first day, as I sat reading emails, I looked out into Stephen's garden, and I spied a meyer lemon tree. That little tree inspired me to start planning a menu around a dessert: tarte au citron. I love all things sweet and savory, and as a rule, I try to resist picking favorites, but this dessert is on my short list, for certain. Perhaps it invokes my mom's lemon meringue pie or it reminds me of my favorite place to travel, Provence--or both, but it is the perfect dessert, fresh and bright citrus and rich buttery goodness all in a shortbread crust. It is like sunshine on your plate and a taste of it on your palate. And, it is a breeze to throw together & almost fool proof! Warm 3oz of butter, 1 tbsp veg oil, 1 tbsp sugar, 3 tbsp water and a pinch of salt in the oven at a low temp until all is melted, about 15 minutes. Quickly, add 1 cup of flour and mix well without overworking. Press into a tart shell and bake for 15 minute at 350. For the filling, you need 1 cup of meyer lemon juice with its zest (this was 5 lemons, but it will vary depending on size and yield), 3/4 cup of sugar, and 12 tbsp butter (yup), whisk and add 4 eggs and 4 yokes (large eggs). Cook over medium heat on the stove top while whisking until all is melted and it thinkens, then pour into prebaked shell and bake an additional 10 minutes at 350. Cool completely to set & enjoy. This one turned out well, but I am thinkinking about a rosemary sea salt crust next time...maybe when I get home!